Double click on the slide show photos above to see the latest! JOIN OUR MAILING LIST & See what's new each week! We've been in the kimono business since 1996, offering traditional vintage Japanese garments, obi, fabric, katagami stencils, and more to those who want to Japanique their wardrobe, artwork, craft projects or home decor. We put New This Week items on offer and/or on sale every Friday! In 2004 we launched our Japanique Boutique, where you'll find modified kimono robes and XL jackets, scarves, noren door curtains, pendants and more! We also host a 9-night trip to Kyoto in October, where 11 travelers visit artisan studios, try their hand at textile workshops, and shop the markets of Kyoto. Owner Nancy McDonough is more than happy to "talk kimono" with you or recommend special places in Kyoto - just email her with your questions! 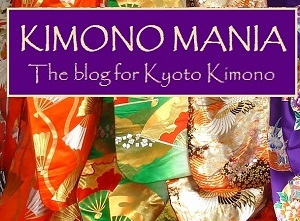 Visit Kyoto Kimono's profile on Pinterest.